And just like that, the new iPad has arrived. 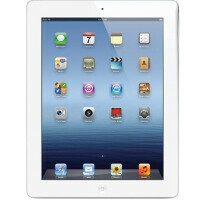 Not the iPad 3, not the iPad HD, as some believed the tablet would be called, but simply the new iPad. And boy does it specs sheet look cool! First, we have that amazing Retina Display with a resolution of 2048 by 1536 pixels, which translates into a pixel density of 264 ppi. Next in line is that A5X processor, which Apple claims to be superior to the quad-core Tegra 3. Not to be forgotten are the 5-megapixel camera with BSI sensor on its back, and the optional LTE radio capable of reaching theoretical peaks of 73Mbps. Sounds pretty awesome, doesn't it? Well, would you like to know how the third iPad iteration stands next to several Android tablets? If so, we have put together the new iPad's specs and compared them to those of four other tablets: the Samsung Galaxy Tab 2 (10.1), the Asus Transformer Pad Infinity 700, the Huawei MediaPad 10, and the Acer ICONIA TAB A700. Which one of them you think reigns supreme when it comes to specs? Feel free to let us know by dropping a comment below. i like how Phonearena just put "yes" on the front facing camera part on the spec sheet. It's not PhoneArena, krApple refuses to publish the FFC specification; it's the same way on krApple's websiTe. I have yet to see the performance of K3V2 quad-core 1.5GHz. The four-core GPU of the new iPad sure is something. But I'd like to see the performance of the entire SoC first. the processor in the "new ipad" is cortex A-9. wow if it stillllllllllll a-9, ok sorry!! its the exact same processor with minor tweaking. maybe they clocked it over 800mhz? lol. now.... with a 1ghz dual core!! no.. more than likely they bumped it to 1.2 to 1.4 to compensate for the higher resolution. Yeah, it's more likely to be at 1.2 or 1.4 otherwise it'll surely lag because of it's resolution alone. it has a PowerVR SGX543MP4. let me repeat that, an MP...4. the new iPad will probably have the best GPU for the rest of the year. powervr is a great gpu, no doubt. still dont know why Sammy moved away from them. the gpu is quad core, the CPU is the same dual core in the last iPad/ i4s. yeah, that's right. Apple would've killed it with a pair of A-15 cores. i'll bet the A6 will be Quad-Core though. Interesting how Apple still refuses (iRefuses) to expressly stiPulAte the resolution and speciFiCation of the Front Facing Camera?????? WTi'F !!! I don't think Phonearena is taking Apple's claim. Afterall the article said "which Apple claims to be superior to the quad-core Tegra 3". What happened to ASUS Transformer Pad Infinity TF700T with 1.6 quad core? That should be on the list also. Dear Ghost Steve Job, I hereby announce you that your fruit company which make overpriced products has totally gone out of control. Therefore i summon your immediate comeback from hell to earth so that you could fixed the new New iPad name. It seems about even with everyone else. I am waiting to see what Samsung brings out. I know that many hear will harp on Samsung. However, they are a major producer of OLED, LCD screens ( including the one the New iPad is sporting). So till Samsung response I will be waiting. Out of curiousity Samsung just filed Patents for flexible screens that bend and roll out to any size. Now that is Revolutionary. I expressed in another post that if the screen was HD RGB matrix Super Amoled plus then it will blow away everything. Lets wait and see.